When you kick start S&K and wait for the title screen to finish you'll see the option to choose your character at the bottom. Press the up and down buttons to select between Sonic and Knuckles, and then press start to begin their game. Whichever character you've chosen, the basic controls remain the same as always: Press the right or left buttons to run in the given direction, increasing momentum as you hold it, up to a certain point. A, B, or C all have the same effect and make the character jump. Hold up or down to scroll the screen up or down a little way after a short delay, and make Sonic or Knuckles look up or crouch down accordingly, when standing still. In addition, you'll want to familiarise yourself with these moves, some relevant to both characters, other specific to one.. Available to both Sonic and Knuckles. Press A B or C to launch straight into a spinning jump. As a spinning ball, you'll destroy enemy robots and barriers, and open up item boxes on contact. You'll stop spinning as soon as you land back on the ground. The longer you hold the button, the more powerful the jump and the higher you'll go. Available to both Sonic and Knuckles. While moving along the ground, press down to curl in a ball and perform the rolling version of the spin attack. This can take out enemies on the ground and is best used when heading down a slope, as your speed will greatly increase. Jump to get out of it, or just wait until you lose all momentum. Available to both Sonic and Knuckles. When you're not moving, hold the down button and Sonic/Knuckles will crouch down, then press A B or C while still holding down and they'll begin to charge up a spinning, stationary assault. Keep pressing A B or C to charge it up further for more power, and then release the down button to let it loose! Your character will gain an instant burst of speed in the direction they're facing, and launch into the rolling spin attack, which can be used to destroy enemies or just for added, instant speed. Available only to Sonic. If you press a jump button again, while having already jumped into the air, Sonic is able to perform a double jump move, dependant on whatever shield item he has. There are three different types of shield, accessed from item boxes dispersed across the zones. With a fire shield, Sonic will dash forward across the air in the direction he's facing when you do a double jump, and this will also destroy any barriers or enemies in your way, much like an aerial rolling spin. A lightning/ring magnet shield offers more of an upward boost, allowing Sonic to perform another upward jump while in the air - perfect for accessing high ledges or attacking a boss that is otherwise too high to reach. Similarly, the water bubble shield allows Sonic to bounce downwards to the ground on the second jump, and he'll then gain more height when he bounces back up, which can then be repeated. Hold the button longer on the second press for a higher bounce. Sonic also has a double jump move when he doesn't have any shields - a split-second white energy barrier commonly known as the "insta-shield". It doesn't give him any extra height or force, but it has a larger radius of attack than Sonic himself, so it can be used to take out an enemy or destructible object that is just out of reach, or guarded in some way. Bear in mind that at no point in the game are any of these double jump moves absolutely necessary to complete an aspect of the level, they are just helpful bonus moves that can make life a little bit easier or shave seconds off of your time. Available only to Knuckles. Glide into most walls and you'll immediately grab hold of it and stay there. At this point, you can use the up and down buttons to scale the wall as required, or a jump button to release yourself. When Knuckles climbs up to a top ledge on the wall, he'll automatically pull himself up onto it. You can still glide away after jumping off from a wall by pressing the jump button a second time, while facing away from it. In addition to those moves, they also have separate attributes and additional abilities too. Sonic can jump higher, able to get on top of certain objects and things that Knuckles cannot get to. On the other hand, while Sonic has to spin dash into barriers and blocks in order to destroy them, Knuckles can break them simply by walking or jumping into them. This even applies to some barriers that Sonic is completely incapable of destroying, sometimes only because they are positioned on the edge of a platform, and Sonic needs to be able to roll into barriers, along the ground, in order to topple them. These separate attributes allow them to access alternate routes from each other at many opportunities. Guide Sonic or Knuckles through several zones, most divided into two acts, each of which normally has a sub-boss or boss at the end. Gameplay basics are as-per-usual. Displayed on the top left of the screen is the on-going score total, timer for the act (you get 10 minutes to complete it or you'll lose a life), and ring count, and the number of remaining lives is listed in the bottom left. You start the game with three lives, and extras are hidden in the levels. You'll lose a life if you take a hit without holding any rings or shield, get crushed between two solid objects, fall off the bottom of the level or run out of time in the act. When you lose all your lives without having obtained any continues, it'll be game over and you'll return to the title screen where you must start all over again. If you managed to get a continue by collecting 50 rings in a Special Stage, you'll be given a fresh set of three lives instead, and will carry on from the last checkpoint touched. Scoring is ongoing throughout the game, with points from each act added to a continuous total. You'll earn points from attacking badniks (see the Common Objects section below), and 1000 for any boss. After an act or Special Stage has been completed, a tally will occur to add up additional points according to your performance. Here, each ring held upon completion is worth 100 points (plus 50,000 Perfect Bonus if you can get all rings in a Special Stage) and the quicker your completion time in an act, the more extra points you acquire. It's quite easy to run up to 9 minutes, especially in the 2nd half, when reaching the boss or midboss, so that 9:59 bonus is a real Godsend if you can get it. You first need to ensure that the boss is going to be hittable on 9:58 and not half-way out of range or through an attack. If it is, time your 8th/final hit the EXACT moment your clock ticks over from 9:58 to 9:59 and it always works in those circs. And, if you are playing as Tails, try to avoid going Super Tails if you are chasing that 100,000, because The Flickies aren't under your control & they do the striking of the Boss/Mid Boss and can make the last hit on 9:57-GRRRR!! Your character's life support system. They're scattered around everywhere, but as long as you have at least one, you won't die when you take a hit from a badnik or obstacle (unless you get crushed by something). Instead, you'll lose all the rings you have, and they'll scatter around the place. You'll be flashing for a couple of seconds, to ensure that you don't get hit again until you've had a chance to move away or grab a lost ring or two. However, if you take a hit without having any rings (or a protective shield), you'll lose a life. Collect 100 rings to gain an extra life, and 200 for another. Use your spinning ability to open up one of these item boxes and receive the displayed power-up. A box with a ring symbol on it will give you ten extra rings, while the one with the face of your character on it will give you an extra life. The speed boost item, represented by an icon of one of Sonic's shoes, lasts for 20 seconds and will increase the speed of your characters movement, plus the tempo of the music. Similarly, an invincibility power-up (the stars icon) will surround him in small stars for the next 20 seconds, during which time he'll be invulnerable to any attack (except falling off the screen or getting crushed). Any badniks that you touch will also explode, and the music is changed to that of the main theme of the game. An additional item box is the Eggman item, which are fairly rare, and should be avoided because opening one will cause you to take a hit. In Sonic 1 and 2, there was only one, blue shield which took a hit for you if you ran into something. As with Sonic 3, this one shield has been replaced by three, and they do the same thing, but offer you additional bonuses as well. Open up a flame item box to receive the fire shield, which will protect your character from any fire hazard, allowing you to touch it without taking a hit. The bubble shield will encase your character within a large bubble, giving him an infinite supply of air while underwater (which is irrelevant in this game, as there is none, but anyway..), and while wearing the lightning shield, nearby rings will be magnetically drawn towards you, allowing you to pick them up much more easily. This shield can also protect you from certain electrical obstacles too, and dissolve the spikeballs of some badniks. While these shields have no other effect for Knuckles, each one allows Sonic to perform a new double jump move while he's holding it (see above). If you take a hit from anything else while holding a shield, you'll lose it instead of your rings, and you can only have one at a time, so a new shield obtained will replace one that you already had. Touch one of these to save your place in the level. If you lose a life, you return to the last checkpoint you touched, instead of the beginning of the act. If you touch one while holding at least 20 rings, a circle of stars will appear above it for a number of seconds before disappearing. Jump into these stars to gain access to one of the two new bonus stages. These giant rings tend to be hidden in small internal rooms throughout the levels, and act as your key to accessing the Special Stage, where you can retrieve a Chaos Emerald. You do not need to have a certain number of rings on hand, you just need to find one and jump in, though it will be gone when you return to the game, at that point. After collecting all the Chaos Emeralds, these giant rings remain, but will give you an extra 50 rings when you touch them. Note that these rings only appear in the first four zones of this game, so if you're going for all the emeralds, this has to be achieved by the time you complete Lava Reef Zone! These sign posts are back, but work in a much weirder way this time. In Sonic 1 and 2, they'd be found on the ground at the end of most non-boss acts, and touching them would end the act. 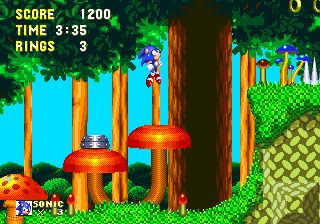 In Sonic 3 and Sonic & Knuckles, they still appear at the end of every first act of a stage, but because you have to fight a mini-boss first, the signpost actually just falls in from the top of the screen, spinning around. You can let it land and complete the act if you like, or more interestingly, you can jump up and knock it around a bit first. If it lands on certain areas of the ground, it can bring up hidden item boxes that it'll bounce off of. These animal capsules appear at the end of an Act 2, after fighting the main boss of the zone. Press the yellow button on top to open it up and free the trapped animals inside, which will end the stage. As tradition dictates, they can mostly be found standing on the ground, to the right of the boss arena, though they can also float down from the top of the screen, upside down, with propellers holding them up. You may have to wait until it gets low enough for you to hit the button. "In Sonic 1 and 2, there was only one, blue shield which took a hit for you if you ran into something. As with Sonic 3 [you mean sonic and knuckles], this one shield has been..."
@Hyper_Sonic He means like with Sonic 3. Surely thats easy to figure oit. Come in horizontal, vertical and diagonal flavours, and in red or yellow. The verticals and diagonals are used to send Sonic or Knuckles flying upwards or across when they are jumped on or touched, and you have a certain amount of directional control, using the left and right buttons. You will not be spinning, however, so be careful of badniks along the way. The horizontals can be used as a quick speed boost across the ground, and red springs are more powerful than yellow ones. Some vertical springs are embedded in the ground, and be careful not to get caught between an annoying pair of horizontals that face each other, and will just bounce you back and forth until you can jump out. Each small set consists of four spikes, and are clearly harmful to touch on their business end, but their sides are safe. Can be found on the ground, ceiling, or horizontally on the walls, and in either large groups or single sets, to jump over. Some can repeatedly slot in and out from the ground. Flat white switches in some levels can cause something nearby to change when you land on top of them. Often used for opening up doorways or bridges. A variety of enemy robots created by Dr. Eggman that are fueled by real animals inside. Each one moves and attacks differently, and are all resident to only one level each. They're all explained individually on their level pages, but most can be defeated by spinning into them, and each one is worth 100 points on your score. Bop some more while maintaining the same spin without breaking it, and you'll score 200 for the second badnik, 500 for a third, and 1000 for each subsequent one until your sixteenth, where they start to spew out 10,000 points a pop. Upon destruction, the trapped animal inside will be set free and skip along the ground happily, before exiting the screen.